NASA Spots What May Be Plumes Of Water On Jupiter's Moon Europa : The Two-Way If jets of water vapor are indeed erupting from Europa, a spacecraft could potentially fly through them and analyze their chemistry. The moon is believed to have a vast subterranean, saltwater ocean. 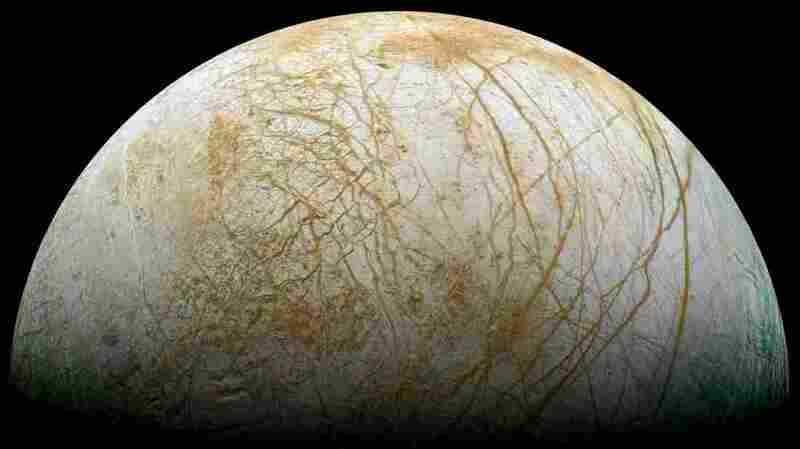 Europa is believed to have a vast subterranean, saltwater ocean that contains twice as much water as Earth's oceans. Scientists have seen what might be plumes of water vapor erupting out of the icy surface of Jupiter's moon Europa, suggesting that its subsurface ocean could be probed without having to drill through miles of ice. That's according to new findings from images captured by NASA's Hubble Space Telescope that were released Monday and that will be published this week in The Astrophysical Journal. Europa is one of the most intriguing places in the solar system because it's thought to have a vast subterranean ocean with twice as much water as Earth's oceans. This saltwater ocean is a tempting target for astrobiologists who want to find places beyond Earth that could support life. The trouble with exploring this ocean is that the water is hidden beneath an icy crust that's miles thick. But if plumes are indeed erupting from Europa, a spacecraft could potentially fly through them and analyze their chemistry — much like NASA's Cassini probe did recently when it sped close to Enceladus, a moon of Saturn that has small geysers. Scientists used Hubble to watch Europa's silhouette as the moon moved across Jupiter's bright background. They looked, in ultraviolet light, for signs of plumes coming from the moon's surface. They did this 10 separate times over a period of 15 months, and saw what could be plumes on three occasions. Scientists scrutinized Europa's silhouette as the moon passed in front of Jupiter and saw what could be plumes of water vapor erupting from Europa's surface. "There are intriguing features apparently emerging from Europa," says William Sparks, an astronomer with the Space Telescope Science Institute in Baltimore, though he cautioned that researchers are really working at the limits of Hubble's capabilities. "The possible plumes are mostly clustered around the southern edge, although there is also one candidate at a more equatorial location." 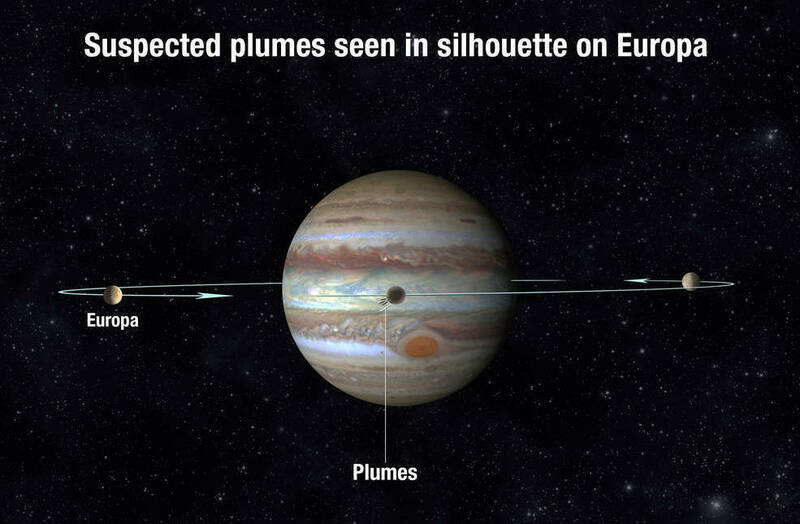 NASA says the plumes are estimated to rise up about 125 miles, and presumably material then rains back down onto Europa's surface. Using Hubble in a different way, scientists previously saw hints that salty water occasionally travels up to the moon's surface. In 2012, the telescope detected evidence of water vapor above Europa's south polar region, suggesting the existence of plumes that shoot out into space. "These are different approaches, but they complement one another and they seem to both be independent evidence of plume activity on Europa," says Jennifer Wiseman, senior Hubble project scientist at NASA's Goddard Space Flight Center in Greenbelt, Md. "On Earth, life is found wherever there is energy, water, and nutrients. So we have a special interest in any place that might possess those characteristics. And Europa might be such a place," says Paul Hertz, Astrophysics Division director at NASA headquarters in Washington, D.C. The agency's Juno spacecraft is currently in orbit around Jupiter, but it isn't slated to take any observations of Europa. However, Congress has ordered NASA to launch a mission to Europa no later than 2022, leading some people to joke that it's the only mission that would be illegal for NASA not to fly. "One of the biggest unknowns we have with these putative plumes is understanding their timing," says Curt Niebur, who is the Europa mission program scientist at NASA headquarters. He says the more observations scientists can get, "the better we can use that to construct a schedule for when we search for these plumes at close range from the Europa flyby mission." Besides the NASA mission, the European Space Agency is planning a mission called JUICE, short for Jupiter Icy Moons Explorer, that will observe Europa and two other Jovian moons.